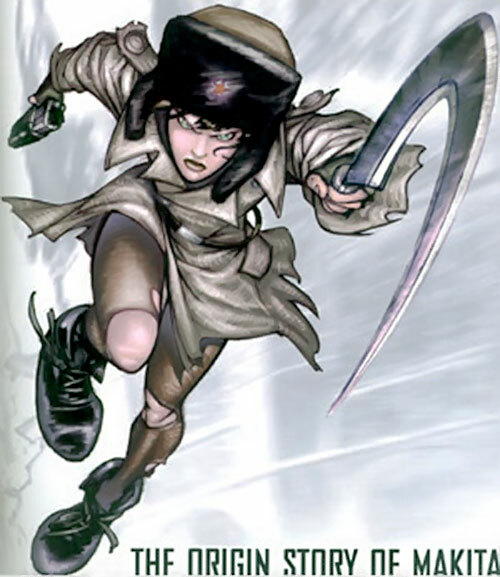 Makita is one of the core characters in the particularly cool comic books series The Red Star, which started in 2000. It takes place in a fantasy version of a crumbling Soviet Union, with magic and psychic powers and city-sized flying fortresses. This profile includes S P O I L E R S.
Other Aliases: Makita, “Makinoshka”, “Fearless”. Known Relatives: Rudov Galilei (father, deceased), Captain Alexandra Goncharova (estranged mother, deceased). Base Of Operations: Skyfurnace Konstantinov, previously Bahamut, Nokgorka. Height: About 5’2” Weight: About 90 lbs. Makita is a hardened guerilla professional despite being a teenager. 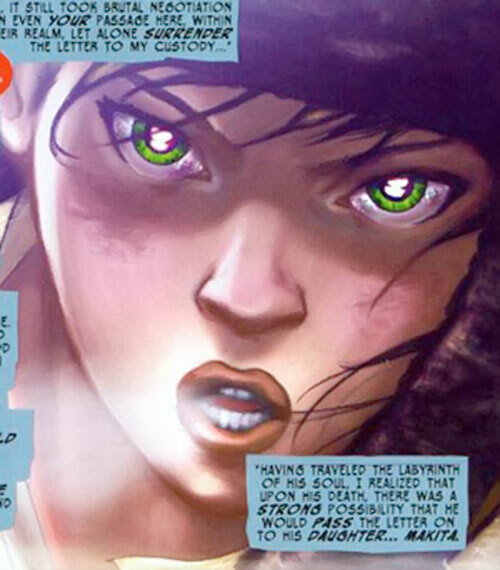 She is also exceptionally athletic and acrobatic, has impressive reflexes and is a tremendous gunfighter. With two pistols and her tactical acumen and gymnastics training, she’s like a little Chow Yun Fat. Makita is a passionaria. Despite her youth, her fiery determination and sheer faith in her country give her great personal magnetism. The mysterious mystical entity called Iakos the Soulthief told the Red Woman that Makita has a spirit not unlike the Red Woman’s own. Her normal weapons are a pair of handguns. 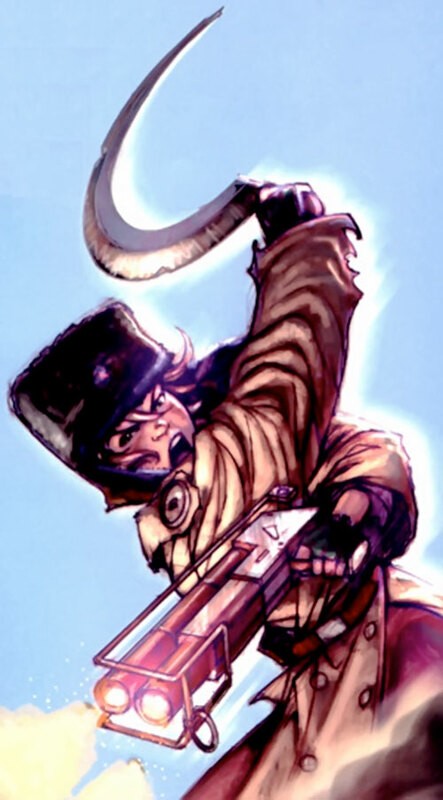 She also carries the hammer and sickle of her father for close combat. Makita uses the sickle to slash open the throat of her opponents, from behind if at all possible. 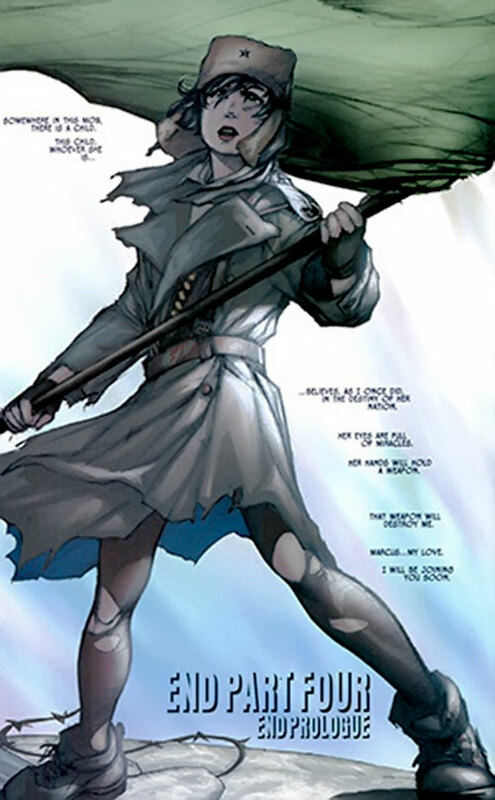 She has been known to use heavier weapons than her handguns — such as assault rifles or a SWORD close-range disposable rocket launcher — when needed, but prefers to fight akimbo. Though Makita is quite young, her military and guerilla experience should not be underestimated. She’s at least as well-trained as any Red soldier, since her father was a Red Fleet veteran and taught her to fight. Even technical procedures such as locking in a railfighter are known to her, though she doesn’t know how to operate some fixed emplacement heavy weapons. 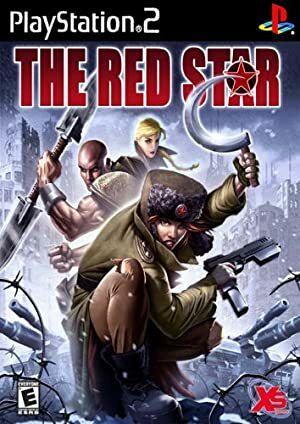 The Red Star graphic novels take place in what is essentially an alternate version of the Union of Soviet Socialist Republics in what might be the 1970s and 1980s. In this setting magic and psionics are well-known and are part of the military, political and mythological landscape. A failed war in a magical equivalent of Afghanistan (Al’istaan). An interminable against separatists in Nokgorka, perhaps loosely comparable to Chechnya – only worse. The people from Nogorka are called “Gorka” (presumably, “Nok” means “land of the”). A “krawl” is a sort of giant tank. A “protokol” is a spell formalised by the State (and you “kast” it). A “skyfurnace” is a sort of gigantic flying fortress/dreadnought crewed by hundreds which can “go ventral” (redirect its titanic engines to incinerate a vast area beneath it). The The Red Star graphic novels come with a lexicon, and reading several of our Red Star character profiles should also be sufficient to get the hang of it. 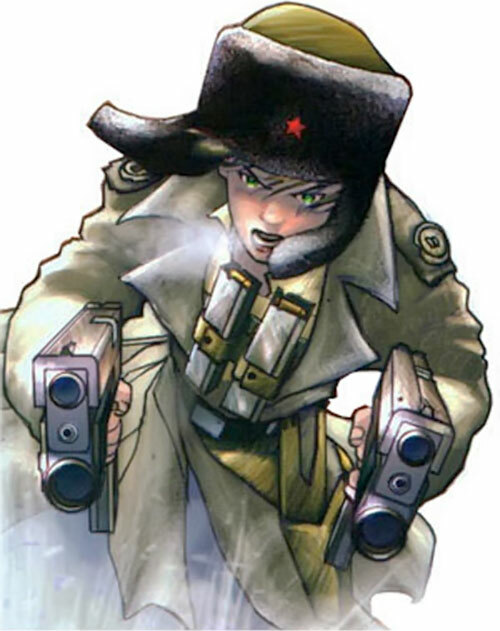 Valentina Galilei is the only daughter of Rudov Galilei, the famous Gorka guerilla leader and former Red Fleet officer. Although she adored her father, she never knew who her mother was, but resented her for leaving her. Mr. Galilei had fought in Al’istaan, where he served along with Srss.-Lt. Maya Antares for a time. Back during Valentina’s childhood, Nokgorka had not yet seceded from the United Republics of the Red Star. Thus, the girl was training to be a child athlete on the URRS’s national gymnastics team. The secession crushed all of this. Valentina’s father defected from the Red Fleet and came back home to become a leader of the Nokgorka Resistance movement. Their homeland was soon a perpetual battlefield. Even as a child, Valentina was a part of Nokgorka Resistance. At first she was a mere runner, but she gradually became a feared streetfighter. She spilled much Red blood in the ruined city of Bahamut – which is both the capital and the heartland of the Gorka. She was soon nicknamed “Makita”, after the mythic, fierce Wolf Princess of Gorka folklore. Despite being in her teens, Makita acquired a formidable reputation. She even managed to be the one delivering the killing blow to a monstrous Hydra-class modular tank, a genuine military exploit. 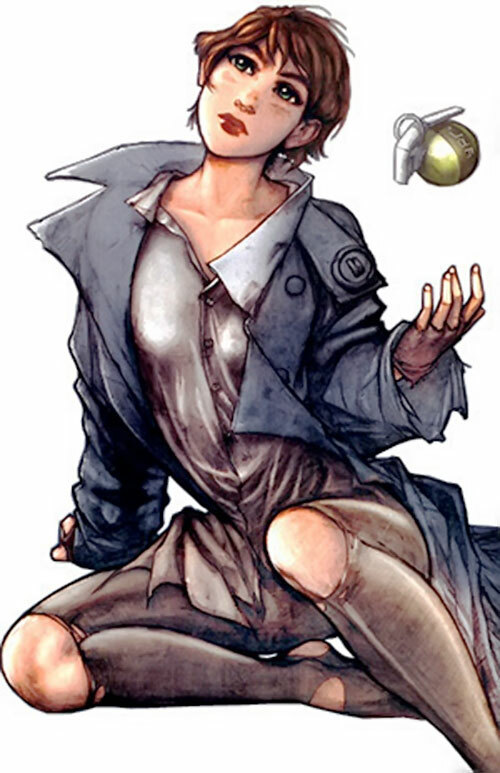 Makita also had a boyfriend, Proto, himself a highly regarded teenage soldier of the resistance. The pair was bound by passionate love. Proto was apparently a bit older than Makita, and helped train her to build upon the lessons of her father. Valentina’s father was eventually badly wounded. He knew that he presumably wouldn’t live to be evacuated from the frontlines. He called his daughter to his side, and she ran through the deadly urban battlefield to reach him before it was too late. Makita was nearly killed more than once – although on the most serious brush with death, her life was saved by Proto. When she reached her father, he gave her his most important possession – a mysterious letter to be delivered to one Maya Antares in Bahamut. Mr. Galilei was adamant that this letter would decide the fate of both their nation and the United Republics of the Red Star, and made his daughter swear to deliver this letter. Rudov gave his daughter his melee weapons (a hammer and a sickle) then sent her running away, as a Skyfurnace was going to go ventral on the area. A few days later, Makita and Proto were part of an assault on a Red krawl column which had been encircled in Bahamut. The assault wasn’t going well. The column’s crew was exceptionally fierce, and only had gotten encircled in the first place since they had fought their way into Bahamut faster and further than their less competent flanking columns. Eventually, an infantry assault was ordered against the Reds. Makita rushed in, attempting to behead the commander of the column from behind with her sickle. The elite female Red trooper sent her flying and levelled her assault shotgun on Makita – but did not fire. 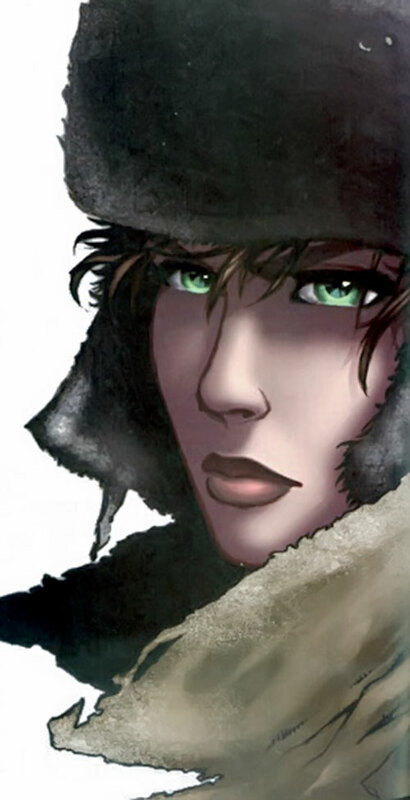 As Makita laid petrified in the snow, the beautiful woman told her to run away and live. Proto, who was covering Makita, shot the immobile Red dead – only to be cut down by Red return fire. Makita was seriously shocked – both by Captain Alexandra Goncharova’s act of self-sacrificial mercy toward her and the loss of her boyfriend. She stayed on the battlefield to erect two graves – carving the word “Love” on Proto’s one and “Mercy” on Goncharova’s one. Valentina then reluctantly left this small, unlikely monument behind. A few days later, a lone Red sorceress came strolling in Bahamut. Makita had several of her snipers try to take her out. But they were all killed by the sorceress’ bodyguard, a deadly Guardsman called Kyuzo. Unable to determine what was taking out her snipers, Makita resolved to kill the Red witch herself. As Ms. Galilei was moving into position, the witch kast a reenactment protocol at the site of Alexandra and Proto’s death. Makita saw the ghostly shapes replay the last few seconds of their lives. She charged the Red with hammer and sickle, only to pretty much collapse crying in her arms as she couldn’t bear seeing it all over again. 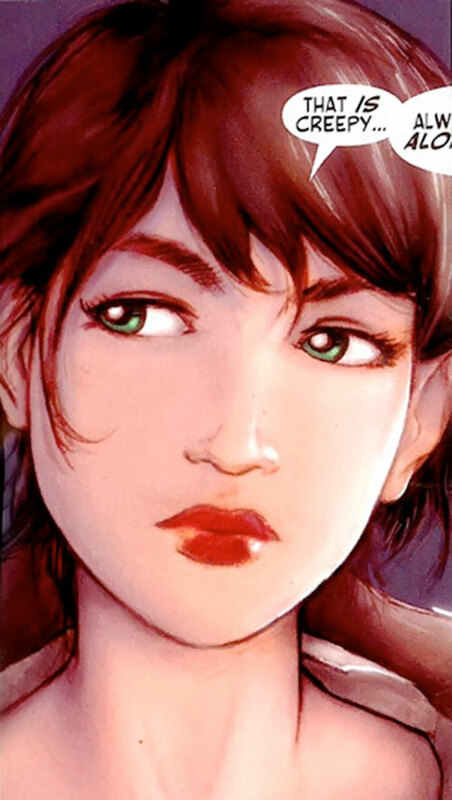 The unlikely spectacle of a Red sorceress consoling a teenage Gorka resistance fighter ended when the Red told Makita she was Sorceress-Major Maya Antares – the recipient of the mysterious letter Makita was carrying. Stunned, as she never had imagined she was carrying a document for a Red, Makita gave Antares the letter. This landmark moment that would indeed change the fate of the Motherland. Makita was then taken prisoner by Kyuzo, and brought aboard the Skyfurnace Konstantinov. Though Makita was initially furious at being a prisoner, the commander of the Konstantinov and his crew decided to mutiny after reading her father’s letter. Thus Makita had single-handedly ensured that the most powerful Skyfurnace over Bahamut deserted. Furthermore, she was soon freed to join the rebellious crew. As she gets older, Makita starts bearing a striking resemblance to her mother – especially her eyes. A fiery, incredibly brave teenage passionaria, Makita deeply believes in the Nokgorka flag and her father’s legacy. She is an odd mix of a teenage girl with boiling emotions, childish insouciance and great pain at her losses, and a hardened soldier who masters a surprisingly wide répertoire of military skills. Makita often talks aloud to her dead father, occasionally to curse him over his trick with the letter. She is terribly eager to do what he would have approved of, what would have made him proud. That made her hesitate as to which side support after she met with Antares, but she was soon won over. Makita originally hated all Reds and seemed particularly hardened. Yet she was very impressed by the crew of the Konstantinov and in particular by Urik, Maya, Kyuzo and their friends. They bonded in battle against a common foe and over the fact that Captain Goncharova had let go of her life so that Makita could live. Soon, the Red friends simply accepted her as one of their own. Though Makita is a bit disoriented by this, she is treated as a peer and a trusted friend. The group acts a little bit as surrogate parents, with Maya displaying a smidgen of motherly support and Urik and Kyuzo both training her and educating her like Rudov Galilei before them. Thus, after breaching the Storm of Soul, Makita began to be significantly less assertive and voluble. For her this is more a period of pondering upon her young life and the drastic changes that just occurred, than a period of leading and being an heroine. This will presumably change as she resumes being a warrior when the Konstantinov reaches its destination. But first she needs to sort out her thoughts as she realises that patriotism and loyalty are more complicated than she thought. Area Knowledge (Bahamut), Familiarity (Military equipment and procedures ; Urban survival), Lightning Reflexes, Luck, Schtick (Paired firearms). Sorceress-Major Maya Antares (Low), Nokgorka Resistance (Low), Guardsman Kyuzo (High), Skymarshall Urik Antares (Low). OPF 10mm handgun [BODY 05, Projectile weapon: 04, Ammo: 20, R#02]. 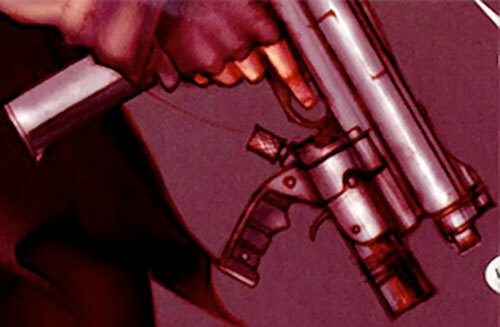 An Officer’s Personal Firearm of the Red Fleet – a high-quality semi-automatic handgun with an extended magazine. This specific weapon was given to Makita by Urik Antares, and once belonged to one Zubov, one of Urik’s oldest friends, who died in battle. Makita did use looted OPFs before, though – occasionally with a 79-9 underbarrel MGL, and usually in pairs or paired with her Samsonov 79. Model 79 Samsonov machine pistol [BODY 04, Projectile weapons: 05, Ammo: 08, R#02, Advantage : Autofire] plus some spare mags. 79s are high-quality, protocol-powered machine pistols and certainly not common-issue ; presumably Makita got hers from the bodies of Red special operations troopers. Despite the high rate of fire and one-handed usage, they can get very tight bullets groupings. Triple-protoclips [Projectile weapons: 05, Ammo: 24, Limitation: Ammo clip for the Samsonov 79]. 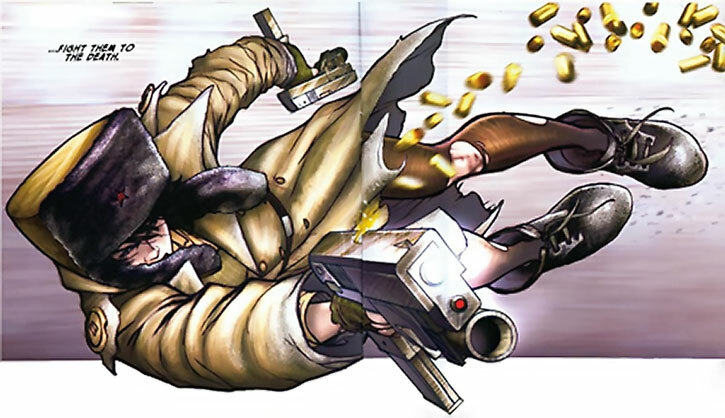 Makita usually loads her machinepistol using prized protoclips (short for “protocol-enhanced ammunition magazine”) ; the space inside these magazines is magically distorted to hold three times the normal amount of bullets. She presumably has one or two. 79-9 Underbarrel Mini-Grenade Launcher [BODY 03, Bomb: 05, Range: 04, Ammo: 01]. This miniature grenade launcher can be railed under a handgun ; both the OPF and Samsonov 79 have suitable railing, and on occasions Makita has had two 79-9s to equip both of her handguns. Normally, the 79-9 builds up a magical propulsive charge based on bleed-off energy from the protocol-powered Samsonov 79 so it can launch its grenade ; presumably there’s a hack to equip a 79-9 mounted on an OPF with a small, one-shot protocol launch charge. Hammer [BODY 06, EV 03] and Sickle [BODY 05, EV 04]. If Makita can scrounge grenades, she will gladly use them. 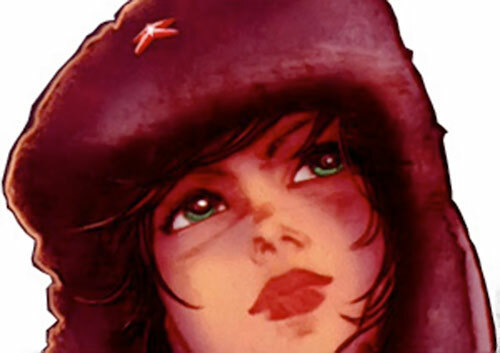 Source of Character: The Red Star (comics). 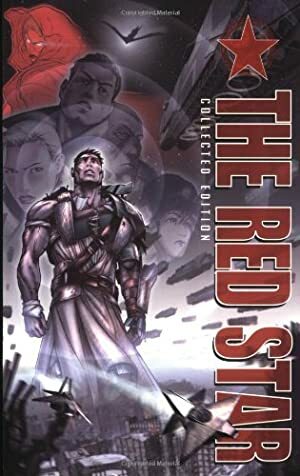 Helpers: Beyond the comics, the The Red Star entries on writeups.org use data from the official The Red Star website and the The Red Star Campaign Setting RPG supplement by Green Ronin. After checking with the fine folks at GR, all the new info in the later was based on the notes from The Red Star author Chris Gossett, who also checked and okayed the final version of the book, so it’s about as canon as it gets.